Ralph Allen from East Texas site, Saul Pacheco from Austin site, Kathy Kraiza from Houston site, and Graham Bateman from Dallas-Ft.Worth site. Members of SA Board. Front row left to right - Suzanne Isaacs, George Chumillo, Lisa Martinez; back row - Andy Hernandez, Minette Gaytan. 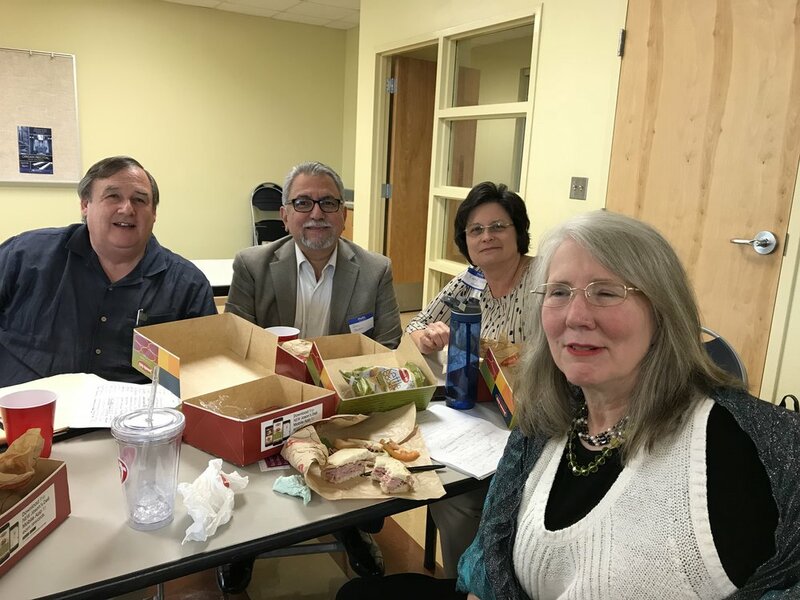 Representatives from various Justice For Our Neighbors (JFON) chapters gathered at University United Methodist Church, San Antonio on April 4-5 for the 2nd Annual Texas Immigration Summit. The gathering was a place for collaboration, learning, and sharing. John Burnam, a local fundraising consultant, helped the agencies realize the impact of individual donors. National JFON Staff Rob Rutland-Brown and Melissa Bowe led workshops on developing and recruiting board members. A joint effort from the six Texas JFON chapters is expected in the future, with a focus on the faces of immigration and how these people were helped. JFON was started by UMCOR in 1996 to assist with the immigrants and refugees coming to the United States. JFON is an immigration ministry of the United Methodist Church.